CAPRICES No. 2. FONTALLARD, Henri-Gérard. Un jeune homme très aimable. A Paris chez Hautcoeur Martinet, rue de Coq, no 15. Lith du Ducarme. 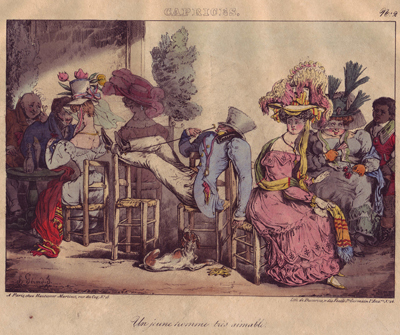 Captions to French caricature rarely get more sarcastically ironic than that which describes Caprices #2, an undated lithograph by Henri-Gérard Fontallard published, according to La Bibliographie de la France, in 1828. "Un jeune homme trés aimable" strictly translates to "An amiable young man," but to capture the true sense and spirit of the scene the caption broadly translates as, "Rude, louche, lazy bum acts like he owns the joint he's parked his carcass in and will take umbrage if you dare ask him to behave like a gentleman and get his feet off the chair and sit up straight. A snooze after liquid lunch, yes, but what does he think this is, his own private sitting room?" Any more relaxed and you could pour cream sauce over the guy and call him fettuccine Alfredo; this dolce far niete has gone too far. The lithograph might just as well have been captioned: Un Valium dans l'aprés-midi, a siesta courtesy Mickey Finn. Henri-Gerard Fontallard (or Gérard-Fontallard) was born in Paris c. 1798, the son of the painter and miniaturist Jean-François Gerard and nephew of the painter Camille Fontallard. He worked for La Silhouette 1829-1830. Raoul Deberdt wrote that Fontallard "displayed the inexhaustible verve of a comedian to parody the doings of his time" (La Caricature et L'Humour Francais au XIXieme siecle, p. 160).